Nolan’s time of 1:41.49 in the 200-yard individual medley (IM), arguably his best event, broke both a meet record and a Pac-12 conference record — both of which had previously been held by Austin Staab ‘11. He finished nearly two seconds faster than any of the other swimmers in the event, including four Stanford teammates that had also qualified for the “A” final after strong showings in the heats. Nolan’s victory was never in doubt, as he jumped out to an early lead and distanced himself from the pack with stellar backstroke and freestyle legs. The victory marked a third consecutive Pac-12 title in the 200 IM for Nolan, as he became only the third athlete in conference history to do so. However, he was disappointed in his other two individual events — the 100-yard backstroke and the 200-yard backstroke — as he failed to take home multiple individual titles at the conference championship for a third straight season. Nolan got off to a strong start in the 100 back and led after the first 50 yards before slowing down considerably in the second half of the sprint, ultimately being out-touched by less than one-tenth of a second by Cal freshman Ryan Murphy. Although Nolan had set a Pac-12 Championship record in the 200 last season, Murphy also stole the show in that event, setting a new meet record as both he and Cal sophomore Jacob Pebley finished ahead of Nolan, who trailed from the start and couldn’t overcome that initial gap with a strong push in the final 50 yards. Although the Cardinal failed to register any victories in the finals of any of the relay events, they had strong performances in which they notched NCAA “A” cut times in all but the 200-yard freestyle relay heading into the upcoming NCAA Championships. While their performance in the finals of the 400-yard freestyle relay was mediocre, as they finished in sixth place — slower than even the NCAA “B” standard — the Cardinal notched an “A” standard time in a morning time trial in which it swam 2:52.79 to propel itself into the NCAAs. 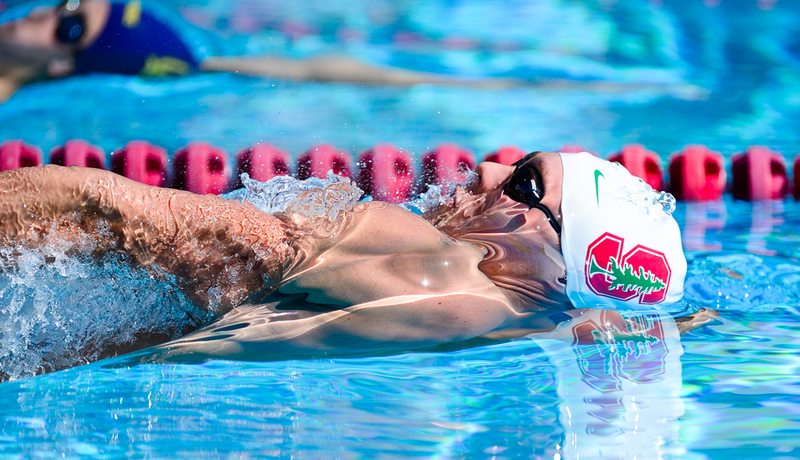 Outside of Nolan’s performance in the 200 IM, Stanford’s swimmers as individuals did not have any eye-popping performances. The only other swimmer to register a top-three finish in a final was freshman Max Williamson, who finished third in the 400 IM while notching an NCAA “B” standard time. Freshman Connor Black and senior Mason Shaw also picked up likely NCAA Championship bids, with Black’s time trial of 46.52 in the 100 butterfly and Shaw’s 53.31 in the 100 breaststroke both surpassing their performances in the finals of those events and putting them within the range of a NCAA “B” cut. The qualified Cardinal swimmers will continue to work towards the NCAA Championships, which will be held in Austin, Tex. from Mar. 27 to Mar. 29. Contact Do-Hyoung Park at dpark027@stanford.edu.